On January 11th, 2018, Mozilla held the first in-person meeting of the MDN Product Advisory Board (PAB) in London. The goal of the MDN Product Advisory Board, in collaboration with Microsoft, Google, and other industry leaders, is to provide guidance that helps MDN be the best reference for web developers. The MDN PAB meeting took place over January 11 & 12, 2018. All current board members attended. The order of business was to review MDN metrics for 2017, get feedback on draft themes for 2018, and hold working sessions to explore a few topics in depth. such as improving accessibility and usability of browser compatibility data in more contexts and scenarios, developing more interactive samples, and setting priorities for upcoming documentation. MDN had a great year in 2017, and we have a solid foundation for 2018. So, how did the board meeting go? Better than I could have hoped! When I started forming the plan for a cross-industry MDN feedback group back in 2016, based on a long-held dream of the MDN writing team and spurred by conversations with folks from Microsoft and Google, I hoped we’d end up with a dedicated group of experts to bounce ideas off and get feedback from, as well as a series of conduits for better information exchange among our organizations and networks, all leading to a better experience on MDN for developers. Over time, the idea solidified into a formal Advisory Board, and I knew it would offer that extensive experience, deep industry knowledge, and interest in MDN we were looking for. What you never know beforehand, though, is how the group dynamic will work in person. I wasn’t nervous, exactly, but wanted to emerge from London with concrete outcomes and actions, as opposed to a laundry list of things we could potentially do on MDN. Of course, I also hoped we’d all work well together and feel the time was well spent. Just as importantly, I hoped we’d bring value back to the broader MDN community. The board meeting surpassed my expectations. There was so much enthusiasm! Everyone participated, shared insights, and made space for each other. It never felt like anyone dominated the conversation or pushed a corporate agenda. The days flew by, and it was only after reviewing the (copious) meeting notes that it dawned upon me how much we’d discussed and how much everyone had volunteered to do. 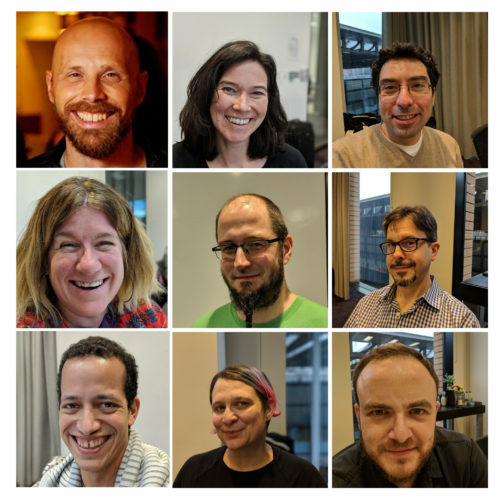 All of the board members feel it is important to be as transparent as possible, so anyone can take a look at the detailed meeting notes and track individual action items—and help out with them, too—on our newly-created public MDN PAB repo on GitHub. The MDN compatibility data project made for a particularly productive working session. In this project, we’ve been migrating browser compatibility data from hand-written HTML tables to machine-readable JSON. 40% of MDN data was migrated last year (HTML, HTTP, JS built-ins, most of CSS). Completing migration of CSS and Web APIs will be a 2018 priority. Board members agreed to drive updates to compatibility data for Edge, Chrome, and Samsung Internet after each stable release and to help review compatibility data PRs that are flagged for their browser. We also will investigate running automatic reviews of data quality based on Web Platform Tests (WPT) and opportunities for using compatibility data outside of MDN. This will include Chrome and Edge extensions similar to the browser extension Compat Report built for Firefox by Eduardo Bouças, integration into browser DevTools or Lighthouse/Sonar, and the use of compatibility summaries in search result rich snippets. The Board had a quick conversation about building a better process for W3C standards authors to communicate changes to MDN writers. In an ideal world, the standard process would include filing a bug to change the associated MDN page when the standard is updated. We agreed to set up a follow up meeting with W3C members to discuss in more depth. There was a lot more discussed, decided, and committed to. (See the full meeting notes.) It was a positive and productive experience, and I’m very much looking forward to the future. Next MDN PAB meeting: Video call in March (date is to be decided, notes will be on the repo).